07 Sep 2017 --- Comax Flavors has released new primary research on consumers’ behavior, usage and attitudes towards Juice. Comax Flavors’ research finds that 58 percent of 174 adult US respondents prefer pulp in their orange juice compared to 42 percent who prefer no pulp. Comax Flavors has released new primary research on consumers’ behavior, usage and attitudes towards juice. This is the second study of the company’s primary market research program. The Juice study was fielded in February 2017 with 500 US respondents aged 18-70+, half of which were parents of children aged 1-17. 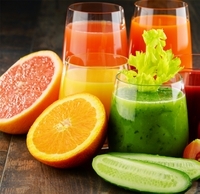 “Because health and wellness is a popular topic and juice has a natural healthy halo, Comax wanted to explore juice consumption habits and usage among the general population,” states Catherine Armstrong, Vice President of Corporate Communications for Comax Flavors. Comax has partnered with Amy Marks-McGee of Trendincite LLC to manage the market research program and Costello Creative Group to translate the data into creative, fun and easy-to-read infographics. Additional Comax studies include flavored water, nutrition and performance products, yogurt, and non-dairy products including alternative milk, non-dairy creamers, plant-based yogurts and frozen desserts.